Targeted traffic from search engines and directories, partner sites, promotion and advertising, while continually improving the ability of your web site to convert visitors into inquiries, leads, and new business. Since 1998, eVisionSEM has been delivering dramatic, measurable results for companies and organizations, from small to large, around the world. He speaks regularly on the subjects of improving conversion rates on web sites and SEM (Search Engine Marketing) and Search Engine Optimization (SEO: improving results from search engines) and is author of the book, The Guide to Search Engine Marketing, a step-by-step approach used by organizations seeking to optimize their websites. George has led the effort over recent years to develop eVisionSEM's advanced methodology known as Conversion Point Architecture to insure that a web site delivers an effective persuasive path, provides a successful branding experience and communicates appropriate messages while insuring that visitors can complete conversion interactions successfully, with minimal errors and frustration and in minimal time. 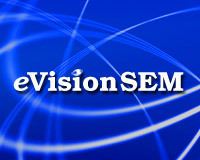 eVisionSEM employs the Conversion Point Architecture methodologies to increase the business a web site generates. Mr Aspland is a regular contributor to Search Engine Land the industry’s leading online publication for the latest search news, research and analysis, commentary and expert advice and PubCon Online Marketing Conferences. He’s a bit of an adventurer and adrenaline junkie. Each year at the Pubcon internet marketing conference for example he goes on some kind of an adventure such as jumping off a tall building, zipping down a mountain, Sky Diving, or doing some laps on race track. George likes less adventurous pursuits too such as playing guitar and occasionally doing open mike nights with small rock groups. Kevin has served as a search engine marketing specialist with Connecticut based Martino & Binzer, a top 50 B2B Agency in the US. He is a Certified Google Adwords marketing expert, managing over $5 million in ad spend over 100 clients, and continues to work with the best and brightest in the marketing industry. Kevin has published numerous articles in various publications regarding marketing and internet marketing strategies. His successes include: Loctite Adhesives, Onsite Gas Systems, Assa Abloy, Polylok Inc, Managed Air Systems, Loctite Adhesives, Pilgrim Electronics, Biolitec Medical Lasers, RBC Bearings Inc, Quick Clot, Z-medica, Skip Barber Racing Schools, Michaud Kinney Group LLP, CR-Tec Engineering and numerous retirement communities around the country and local businesses. Kristen is experienced in Search Engine Advertising, Display, Social and Mobile advertising. She has worked with a variety of clients ranging from Fortune 100, to small, local businesses including companies such as General Mills, Enterprise Rent-a-Car, Casual Male Big & Tall and many more. She is Google Certified (in Fundamentals, Search, & Display) and MSN/Bing Certified (which now represents Yahoo!). Denise is experienced in Search Engine Advertising and Product Listing Ads (Google & Bing Shopping). With over 10 years of experience in both B2B and B2C she has worked with small, local businesses to large eCommerce companies like Miles Kimball and Walter Drake. She strives to deliver profitable search solutions and attract and maintain customers for her clients. Jason is an all-round digital media professional with core expertise in search engine marketing and programmatic media. His expertise has enabled different types of advertisers to not only efficiently scale their business models on the web, but to also effectively make sense of their massive amounts of collected media data. Having exceptional experience with best in breed digital advertising products and platforms, and having numerous high visibility publisher relationships makes Jason a critical asset to many organizations. For many years he has been responsible for directing, planning and executing $1MM+ monthly media budgets for some of the largest and most well-known businesses. Amanda works with eVisionSEM clients to improve their online presence through local listing management, social media marketing and referral site development. She has worked with some of the largest names in the marine industry, managing their email marketing and social media. In 2014 she was proud to be a part of planning and marketing New England’s largest in-water used boat show, which tripled its attendance in just one year. In her free time, Amanda is an avid reader and loves to cook! To learn more about eVision's services, please call us at 203.481.8005 or use our contact form.